Contact us to get you and your horse on the right track. After working with Peter, you'll agree, It's A Pleasure! Space is limited each month, and generally book about 2 months in advanced. In addition to training, It's a Pleasure offers different boarding options to fit your needs including options to execise your horse on a regular basis, lay up and retirement board. Every year, It's a Pleasure Training hosts and participates in a variety of clinics, events, showcases and challenges such as Versatility clinics, round penning clinics, the Youth Mustang Challenge, and the Extreme Mustang Makeover. For more information on hosting or participating in one of these events, please contact us. It's A Pleasure Training and Crimson Acres offers a horse training internship for qualified applicants who are considering a career in the equine industry, an equestrian lifestyle or are looking to fulfill college requirements. This is a great opportunity for individuals to further their riding skills, training techniques and teaching abilities, as well as, general horse care knowledge and stable management skills by working directly with the trainers, barn managers, horse owners, clients, and other equine professionals. Gaining real world experience of running an equine business in a friendly, honest and reputable program. Our farm is a full-time, family based operation which offers training, lessons, boarding, clinics and sales. 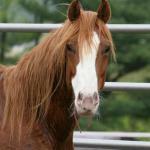 Our two facilities consist of over 80 horses representing a variety of breeds, ages and experience. The intern program can provide individuals a chance to explore different avenues of the horse industry and allows for flexibility to adjust the program to fit your needs. Housing can be arranged if needed and reliable transportation is helpful but not necessary. Length of internship can be determined based on the interns needs and schedule. Link for application can be found at bottom of the page. - Assisting vet, farrier, dentist, chiropractor, etc.